The BloodMove Platelets project was implemented in a staged manner following initial planning, preparation, consultation and education. Initial planning included auditing inventory levels, platelet usage and wastage patterns across all metropolitan public hospitals. 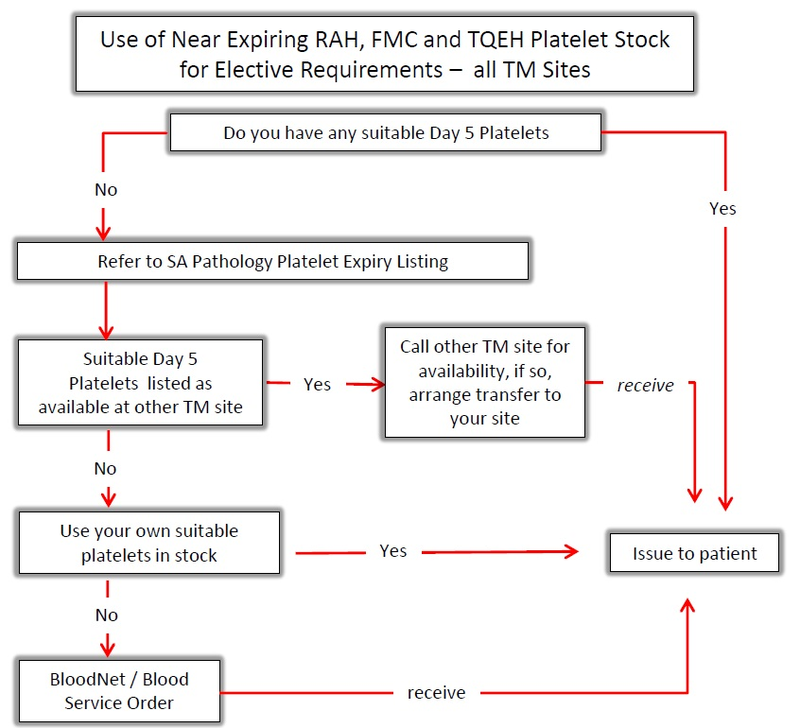 reducing platelet inventories deemed excessive. The next stage of the project implementation commenced in late July 2014 with transfer of Day 4 platelets from smaller metropolitan Transfusion Service laboratories to larger Transfusion Service sites in anticipation that the platelets would more likely be used at those sites. As a result, the platelet wastage rate at the smaller sites approached 0%. To deal with the increased number of Day 5 platelets at the larger sites, a daily shared Day 5 Platelet Listing was prepared for use by all public Transfusion laboratories and more recently private pathology laboratories. This Day 5 Platelet Listing was used by all Transfusion laboratories to source non-urgent platelets in preference to using available fresher platelets (i.e. Day 3 or Day 4) or requesting platelets from the Blood Service through BloodNet. 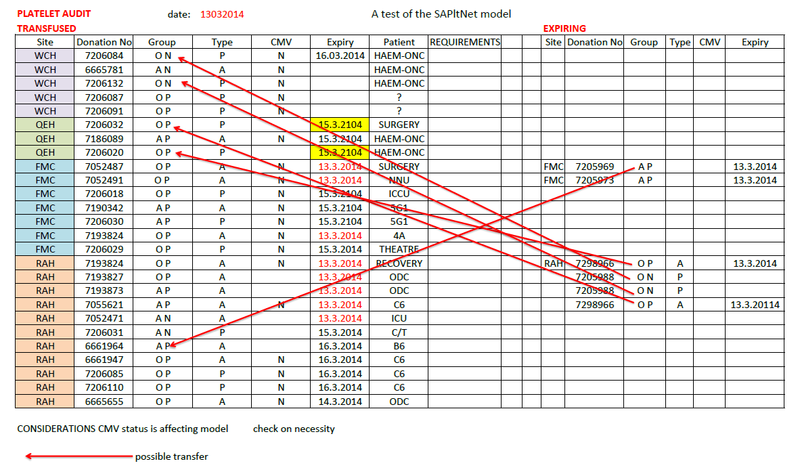 Initially, the Day 5 Platelet Listing was faxed daily to all stakeholder Transfusion Service sites, but the later development of an IT network solution provided an ongoing updated online Expiring Product Report (i.e. Day 5 report) which was accessible by all public Transfusion Service sites through the SA Health intranet. The process was later transferred to the internet and since early April 2015, two large private pathology Transfusion laboratories can also view the State’s Day 5 Platelet Listing. Once the process was stabilised, inventory levels were appropriately reduced at the main sites receiving the Day 4 platelets. Subsequent stages included the targeted reduction in platelet inventory of those blood groups typically having a high discard rate and optimal number of CMV negative platelets in the inventory depending on clinical use. The inventory of group O low titre apheresis and pooled platelets was increased, in preference to holdings of other ABO types to facilitate increased ABO cross grouping . ABO cross group, i.e. issue of ABO minor incompatible platelets, was already being successfully practiced at some medium metropolitan sites. However it was not commonly practiced at large sites which maintained a wide platelet blood group inventory, resulting in these sites having the highest discard rates. 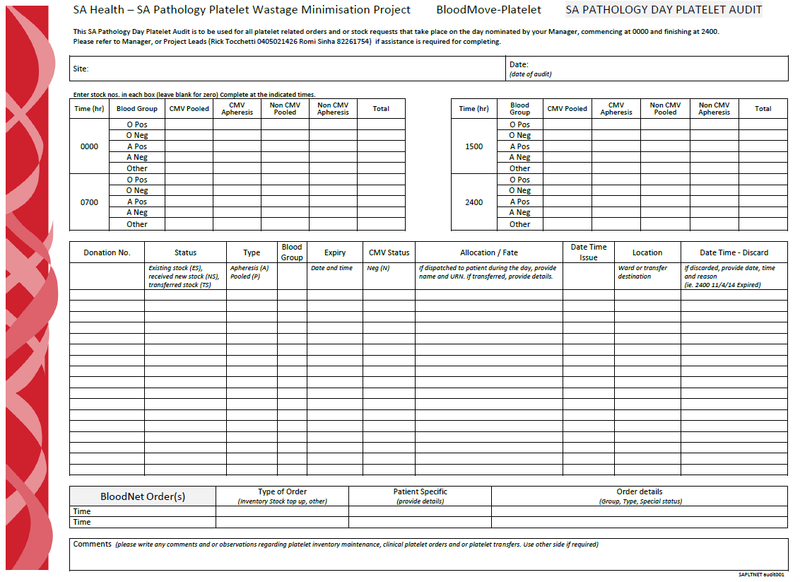 A group O inventory allowed for adoption of a policy in which Day 5 group O platelets were issued in preference to ABO specific Day 3 or Day 4 platelets. This practice contributed to wastage reduction. 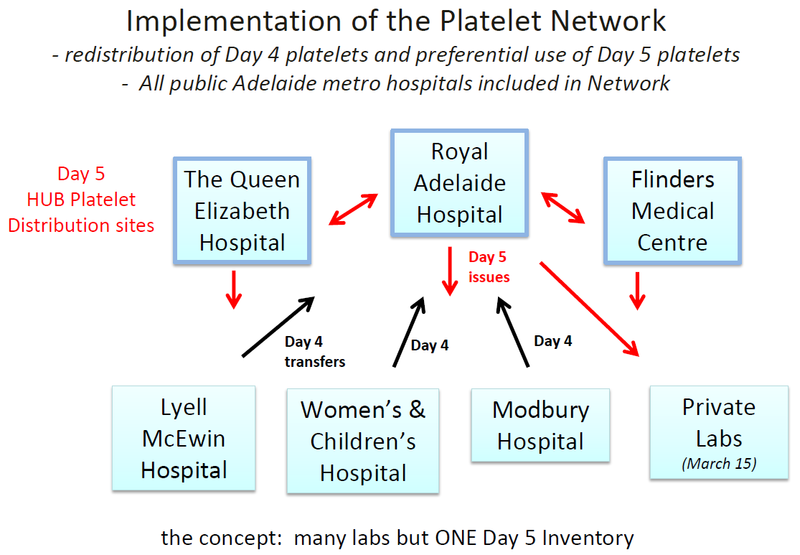 The haematology / oncology wards at the Royal Adelaide Hospital were the biggest users of platelets in Adelaide and the BloodMove Project Team engaged with staff on these wards to streamline platelet ordering practices using the BloodMove single inventory model. Staff on the wards were requested to obtain their patient platelet counts earlier in the morning allowing placement of platelet unit orders earlier. This allowed the sourcing of Day 5 platelets from other sites in metropolitan Adelaide. Additionally, all clinical units ordering platelets electively were asked if the order could be fulfilled within the timeframes that allowed sourcing from another metropolitan transfusion service laboratory. To facilitate faster platelet transfers across metropolitan sites an alternate shipper was validated, which was simpler to pack and use. 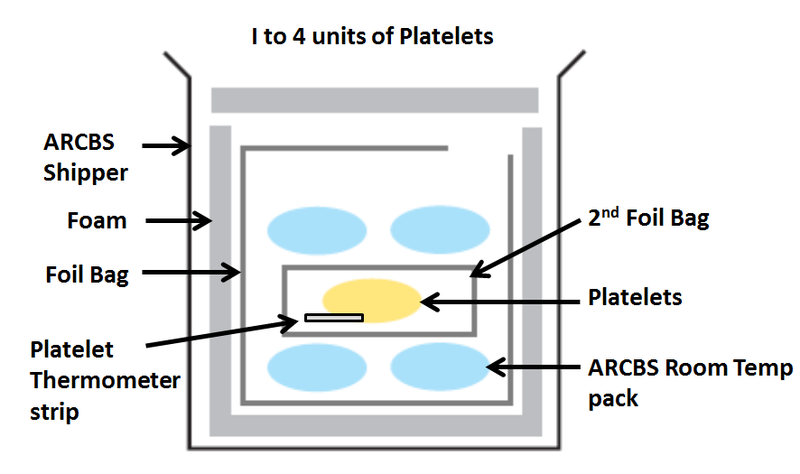 The Blood Service platelet shipping configuration (P2) then in use was generally regarded by operational staff as cumbersome/ heavy and complex to pack for routine simplified use. Initially a hard case polyurethane based shipper was used, but later the existing Blood Service shipper was re-adopted using an alternate validated configuration which was very simple and quick to pack. 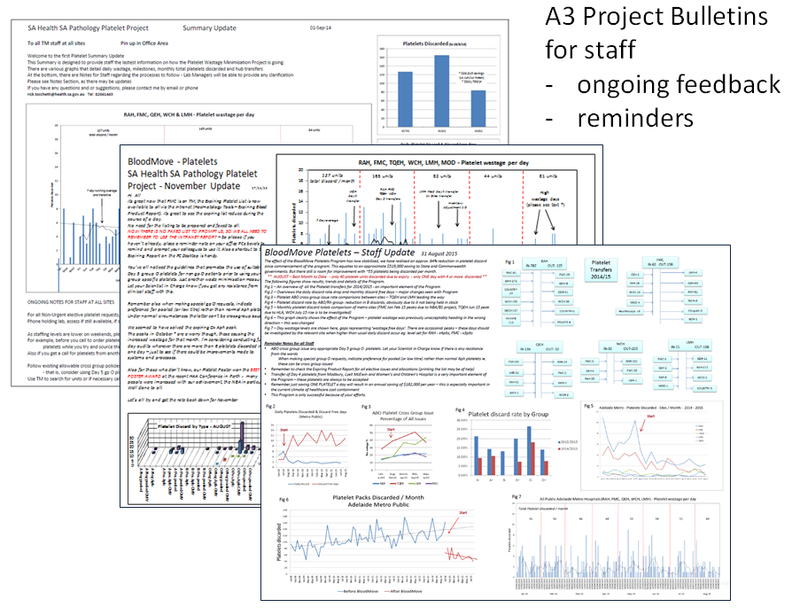 During the project it was found to be very important to provide ongoing feedback and information to all stakeholders. The Project was facilitated by regular meetings between SA Pathology transfusion service laboratory managers and stakeholders. The Project utilised clear and ongoing communication and education between all stakeholders; such as staff from transfusion service laboratories, clinical units (especially haematology/oncology wards), couriers and the SA Pathology IT programmers. This supportive network has been established to ensure that inventory management best practice is maintained across SA Pathology transfusion service network of laboratories. The BloodMove Team made regular health network site visits and conducted in-service educational sessions to nursing, midwifery, medical and specialist practitioners covering all aspects of the Project. Stakeholder feedback and suggestions were actively sought and acted upon by the Project Team. The Team regularly presented at stakeholder management meetings to ensure that information was disseminated and that all identified issues were discussed and addressed.